It is illuminating to read the history of this unique educational institution as it was viewed by its founding educator in its 15th year. This brief overview was delivered in a speech by Karl G. Maeser in 1891. When, at the April conference 1876, President Brigham Young appointed me as principal of the educational institution that has been established at Provo and bears the name of its illustrious founder, it was with no comprehension of the magnitude of the work that the appointee laid out the plans for his new mission. Adding another experimental term to one conducted by his predecessor, he found premises inadequate, facilities limited, students few in number and poorly prepared, and financial conditions exceedingly discouraging. To make matters still worse, there were many even among the influential men in the community who not only had no confidence in the stability of the new venture, but openly opposed it by using their influence against it. Yet there were some signs prophetic of a more prosperous future, in the growing enthusiasm of the students, in the spreading influence outside the schoolroom, in the unqualified support of President Abraham O. Smoot, and in the approval of the Presidency of the Church. This was the condition of affairs when in August of the same year the first term of the first academic year was commenced. The two experimental terms had demonstrated the fact that the strength of the Brigham Young Academy was not in her financial condition, nor could her aims be to enter, for the present, into competition with institutions of higher education in our country, nor was her distinguishing characteristic to be sought in the professional efficiency of her teachers alone, for all of these advantages have been claimed and enjoyed by schools of learning before, and yet the necessity for the establishment of a new kind of educational institution for Zion had been revealed by the Lord to the Prophet Brigham Young. The lack of what element created that necessity? It has been said the Saints will be saviors upon Mount Zion, that they are destined to redeem the world. Redeem the world from what? From the thralldom of sin, ignorance, and degradation! In order to do this, Zion will have to take the lead in everything and consequently also in education. But there is much education already, much science, much art, much skill, and much so-called civilization -- in fact, so much that this generation is fast getting into the notion that they can get along without a god, like the Titans of old that wanted to storm the heavens by piling one mountain on top of another. A glance over the conditions of mankind in this our day with its misery, discontent, and corruption, and disintegration of the social, religious, and philosophic fabrics, shows that this generation has been put into the balance and has been found wanting. A following, therefore, in the old grooves, would simply lead to the same results, and that is what the Lord has designed shall be avoided in Zion. President Brigham Young felt it in his heart that an educational system ought to be inaugurated in Zion in which, as he put it in his terse way of saying things, neither the alphabet nor the multiplication table should be taught without the Spirit of God. Thus was started this nucleus of a new system. When, years after, a certain person could find no other fault with it than that it should have started some twenty years before, I thanked God that it hadn't; for if it had been thus started without teachers to comprehend its aims, without boards to enter into its spirit, and without students to feel its necessity, unavoidable failure would have postponed a successful commencement for a generation or more. All the above-mentioned adversities of the infant institution were blessings in disguise. Without means, by relying upon the liberality of her patrons, the Academy engendered a growing interest among the people in its aims. Without teachers sufficiently devoted to its sacred cause to labor for a mere nominal salary, the Academy was forced to create a Normal department composed of volunteers, to raise her own teachers. Without a board of members experienced in educational affairs, they went through an empirical training in having their attentions turned gradually from the primitive conditions of the beginning to the more complex organization of the school's further advancement. If amidst all these changing scenes clouds of discouragement did occasionally darken the horizon of our vision, they were always dispelled by the voice of the spirit whispering: "O ye of little faith." Amid the ever-changing scenes of development which Brigham Young Academy has passed through, whether holding forth in one single room under makeshift arrangements or enjoying the benefits of more suitable facilities: whether in rented premises, fitted up for the time being, or in her own palatial habitation; whether laboring according to the humble programme of the primary and intermediate grades or aspiring to academic or collegiate honors; there must go through it all, like a golden thread, one thing constant: the spirit of the latter-day work. As long as this principle shall be the mainspring of all her labors, whether in teaching the alphabet or the multiplication tables, or unfolding the advanced truths of science and art, the future of Brigham Young Academy will surpass in glory the fondest hopes of her most ardent admirers. 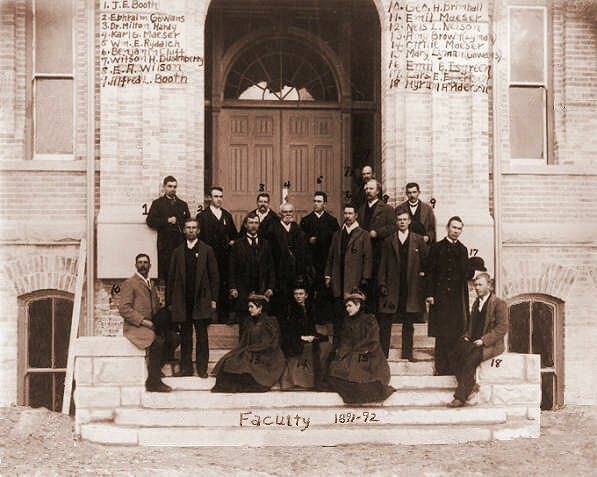 Maeser Faculty in 1891 on unfinished steps. The above address was delivered on October 16, 1891, at Brigham Young Academy's first Founder's Day exercises. 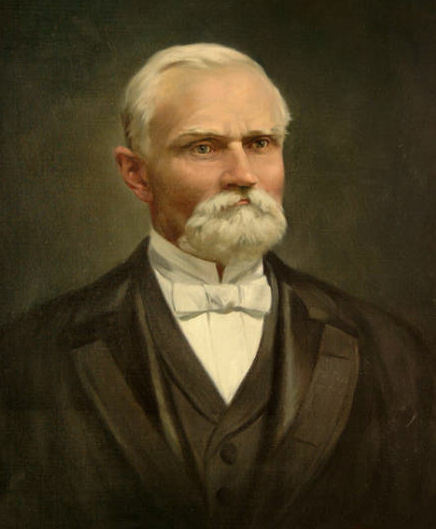 Karl G. Maeser served as principal and president of Brigham Young Academy from 1876 to 1892. Printed in Reinhard Maeser, Karl G. Maeser (Provo, Utah: Brigham Young University, 1928), 128-132. I Have Had a Dream. Under the leadership of Principal Karl G. Maeser, Brigham Young Academy established itself as one of the leading secondary schools in Utah territory. The faculty frequently expanded the curriculum to meet the ever-changing and ever-increasing needs of local and regional education, and the thirst for LDS teachers. The uniqueness of the school lay not in its academic emphasis but in its religious foundation. 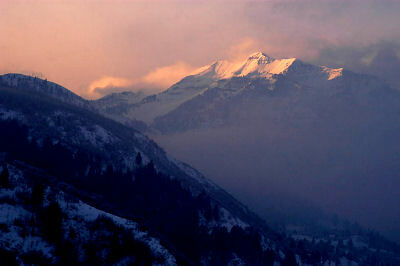 Maeser placed the development of character above the development of intellect. He taught his students that lessons themselves were not the most important part of learning. He taught that honor was more important. For example, if a student accepted an assignment it became "a matter of honor to be prepared . . . if you have to sit up all night." He did not teach the subject as much as he taught the student. In matters of morals and religious conduct, he saw things as black and white. He devised for Brigham Young Academy an intricate system of rules, regulations, and academic routine all designed to illustrate and form habits of proper conduct for a lifetime. On the night of January 27, 1884, a fire of undetermined origin destroyed the entire Lewis Building, the Academy's home for eight years. Many thought that the fire meant the end of the Academy. Meeting Professor Maeser on the street, Reed Smoot said, "Oh, Brother Maeser, the Academy has burned." Maeser answered, "No such thing; it's only the building." 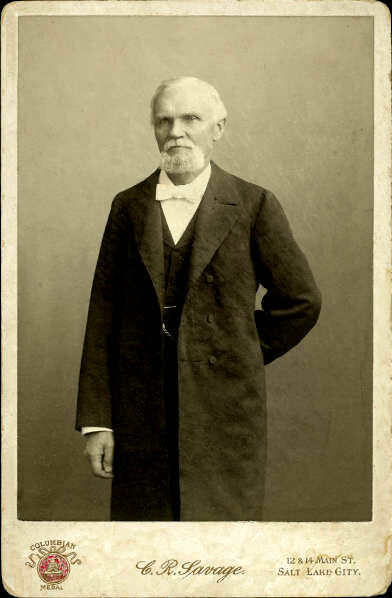 During one of many financial crises, Karl G. Maeser informed his wife and daughter that because of lack of sufficient money on which they could live, he was going to accept a position at the University of Deseret in Salt Lake City. Accordingly, his wife and daughter got things packed and sat on their trunks. When the daughter finally mustered enough courage to ask her father when they were moving, his response was, "I have changed my mind. I have had a dream - I have seen Temple Hill filled with buildings - great temples of learning, and I have decided to remain and do my part in contributing to the fulfillment of that dream." Maeser repeated this story to his daughter on many occasions. During the entire duration of Maeser's administration, he and his colleagues struggled to keep the institution afloat so that his dream could eventually come true. Maeser will always be known as the spiritual architect of Brigham Young Academy, Brigham Young High School, and Brigham Young University. He is also known as a man who temporally "endured many things." "I should be ungrateful," he once said, "if I did not place myself on record as being conscious that the Brigham Young Academy has been a chosen instrument in the hands of the Lord God of Israel, to plant the seed for an educational system that will spread its ramifications throughout all the borders of Zion, penetrating with its benign influence every fireside of the saints, and open to our youth the avenues to all intelligence, knowledge and power." 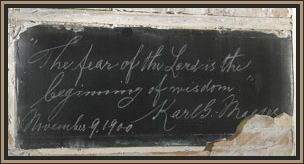 Karl G. Maeser's handwriting on a chalkboard.